28 January - AGM and "The History of Calan Hen"
Saturday 21 March, 9.30am-1pm "A Pint of History, please!" in the The Daffodil Inn, Penrhiwllan. Come and share stories and history of Penrhiwllan and surrounding areas. There will be a small exhibition. Sunday 12 April. 12noon-5pm. "A Pint of History, please!" in the Half Moon, Pont-Tyweli. Come and share stories and history of the Pont-Tyweli Pubs - Half Moon, Cilgwyn Hotel, Wilke's Head. There will be a small exhibition. Saturday 18 April, 10.30am-4pm. Ceredigion Local History Forum at Llwyncelyn Hall “It’s all in the News: how digitised newspapers have changed our view of history”. 29 April - "The Empress of Ireland"
Wednesday 6 May, 6pm-10pm "A Pint of History, please!" in thePorth Hotel, Llandysul. Come and share stories and history of the Porth and other pubs in Llandysul. There will be a small exhibition. Sunday 14 June, 2-5pm - "A Pint of History, Please" in the King's Arms, Llandysul. Come and share stories and history about the King's Arms, the King's Head and the Crown Inn. There will be a small exhibition. Monday 29 June, 10.30am-1pm - "History with a Cuppa" in the Daffodil Inn. Monday 6 July, 6-9pm - "A Pint of History, Please" in the Cilgwyn Arms, Llandysul. Come and share stories and history about the Cilgwyn Arms. There will be a small exhibition. Wednesday 29 July: Visit to Italian Prison of War Chapel, Henllan. Meet there at 6.20pm for tour to start at 6.30pm promptly. Tour by Mr. Jon Meirion Jones. The chapel is not open to the public and so we are very lucky to arrange this visit with the owner Mr Thompson and to have Mr Jon Meirion Jones act as our guide. This is a great opportunity to visit a hidden gem of West Wales. Please come along! Cost: donation of £4 minimum. A brief history of pubs, schools, shops. Meet at Llandysul car park. We will be walking to Pont-Tyweli and back through Llandysul. Approx 2 hours. Finishing at the Porth Hotel. Lunch can be booked 01559 362202. Dogs on leads are welcome but we will be stopping frequently. £1 for adults. Children under 16 are free. 28 October - "'The Welsh cattle droving trade c. 1750-1860, with particular reference to Dyfed.'" 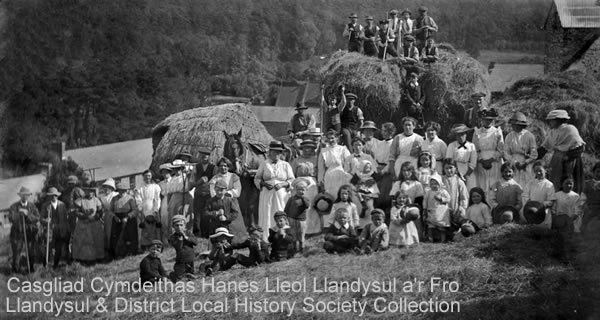 14 November - Ceredigion Local History Forum meeting "Industries in Ceredigion"
25 November – Film night! "The Last Days of Dolwyn"